In a sauté pan (I use my cast iron), over medium-low heat, add butter & onions. Allow the butter & onions to lightly brown – stirring occasionally. This step takes about 10-15 minutes, but please don’t skip it – This is what breaks down the onions and adds amazing flavor to the gravy. Reduce the heat if you feel like the onions are burning or cooking too fast. While onions are browning, whisk together Gluten Free Flour and Seasonings. Measure out Broth & warm in separate pot with Meat Drippings (if using). Cook until hot, then set aside. Once Onions have finished browning, sprinkle the Flour over the onions & stir briskly to evenly distribute. Pour in your hot Meat Drippings (if using), Broth, and Apple Cider Vinegar stirring constantly to dissolve lumps. Stir over heat for an additional 3-5 minutes until gravy has thickened. Remove from heat & allow to rest 5 minutes before serving. If you feel the Gravy is too thin after cooking, just whisk in an extra tablespoon of flour and thicken it up over medium heat. If you feel like the Gravy is too thick after cooking, then whisk in more Broth until desired consistency is reached. 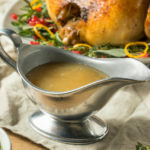 Do you prefer a smooth Gravy? No problem, just pulse the gravy a few times with your immersion (hand) blender. Store leftovers in an airtight container & reheat for leftovers.